We killed, buried cleric, woman, kidnap suspects confess - BlogIT with OLIVIA!!! As the Rivers State Police Command paraded over 146 suspected criminals in Port Harcourt, a gang of kidnappers has confessed to killing and burying two of their victims. Parading the suspects, the State Commissioner of Police, Mr. Musa Kimo, disclosed that the suspects were arrested from different communities in the state. He noted that the suspects were arrested in connection with different offences, ranging from, cultism, armed robbery and kidnapping. Musa, who spoke through the State Police Public Relations Officer, Mr. Ahmad Muhammad, expressed regret that some of the suspects did not only kidnap their victims, but also murdered them. 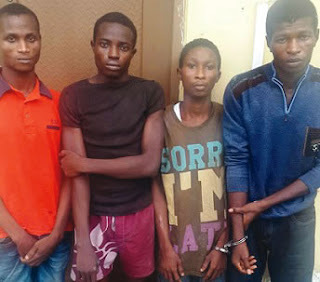 When Southern City News interrogated the kidnapers, who allegedly killed and buried their two victims in Ohigha community, Ogba/Egbema/Ndoni Local Government Area of the state, they (suspects) confessed to the crime. The suspects, Henry Ajie, Bright Ajie, Dadison Ogadinma and Sampson Dibia, confessed that they were kidnappers and killers. Speaking for the gang at the police headquarters in Port Harcourt, Henry Ajie told Southern City News that they kidnapped and killed their two victims, Mrs. Igila Sunday and Pastor Chukwu Ekere. The State Police PRO had earlier told newsmen that the gang kidnapped and strangled the duo and buried their corpses in shallow graves after collecting ransom. But, Ajie revealed that they (suspects) killed them based on instruction from relatives of the victims. He said, “We were arrested by the police because we kidnapped and killed one woman and one pastor in Ohigha community. “It is the woman’s son-in-law that brought the job to our boss, Mr. Dreadman Okala. The son-in-law told us that her (Mrs. Sunday) husband was paid huge amount of money. On the killing of the clergyman, the suspects stated that they were commissioned to eliminate the pastor by his (the pastor’s) younger brother. He said, “Pastor Chukwu Ekere’s own is that it is their last born that came to tell our leader that the pastor was disturbing him that he wanted to kill him.